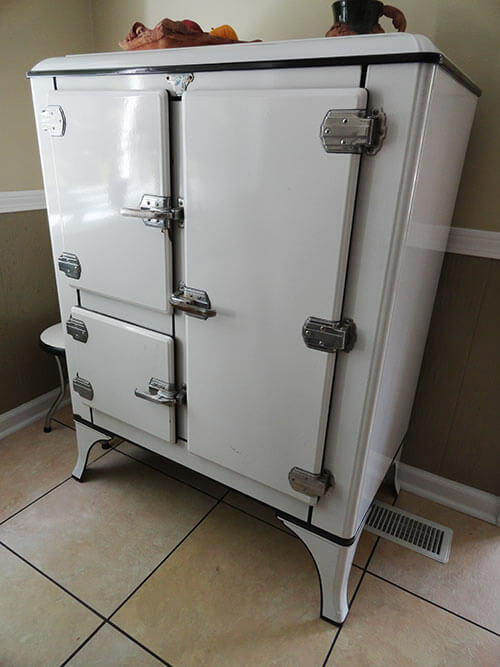 Home » Mid Century Culture » woddities: wonderful oddities » 12 vintage refrigerators — from rare to wacky to sublime! 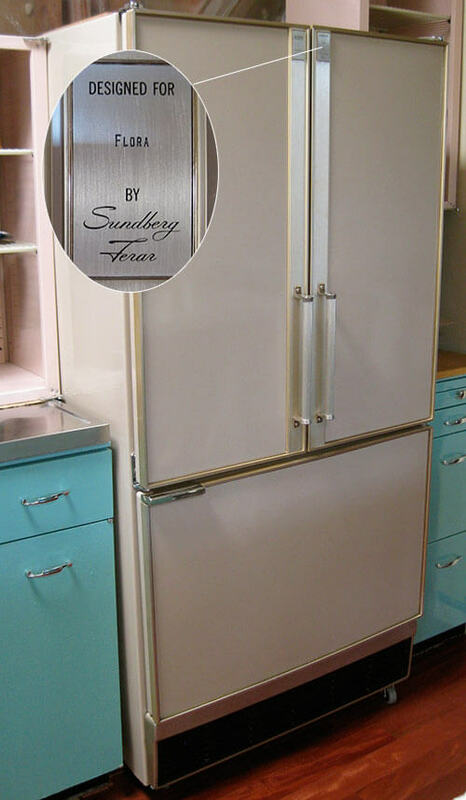 12 vintage refrigerators — from rare to wacky to sublime! In my recent guide to buying a retro refrigerator, buying vintage was tip #6. 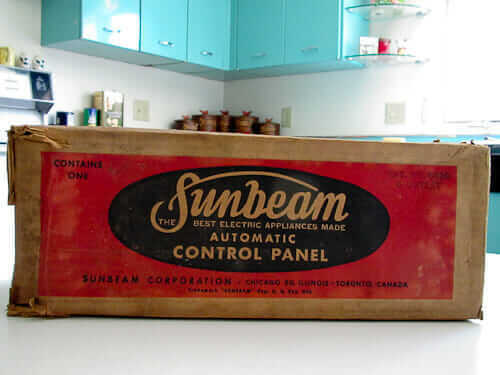 That prompted me to look through lots of stories in our archives and put together this roundup of 12 vintage refrigerators. Spanning 1934 to the mid-1970s, these vintage refrigerators are marvelous, wacky, classic, or rare — chosen to taste some of the coolest kitchen appliances that American had to offer. Above: the incredible GE Refrigeration Center. 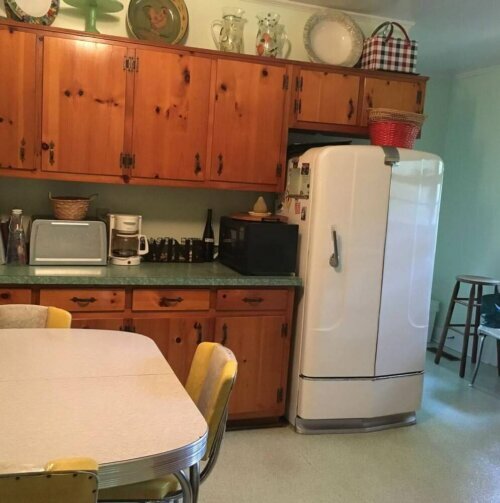 This amazing kitchen appliance has a wall-hung refrigerator and freezer on top and presumably, a refrigerator and freezer drawers on the bottom. In between are the famous GE Cabinettes. The GE Refrigeration Center is #1 on my list as the most amazing refrigerator ever. Yet, still, 13 years into blogging, I’ve still have not seen or heard of one in the wild. Sigh. 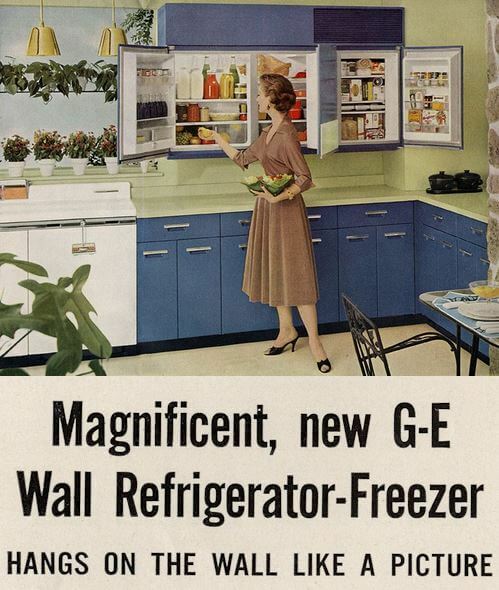 We have seen many “magnificent” GE Wall Refrigerator-Freezers, although none that I recall still in working order. Bueller? Bueller? 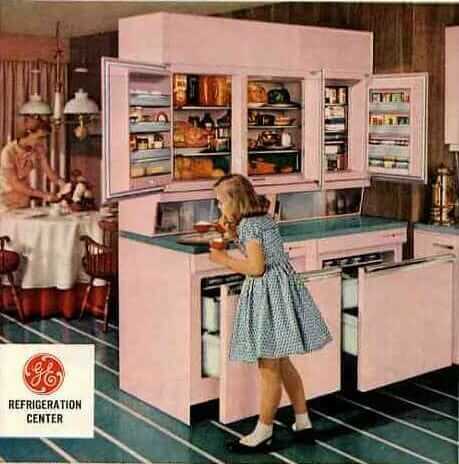 This remarkable refrigerator — which presents like a set of kitchen wall cabinets — was introduced in 1955. I will presume it pre-dated the GE Refrigeration Unit, although I don’t know for sure. More photos and images about this GE wall fridge here. 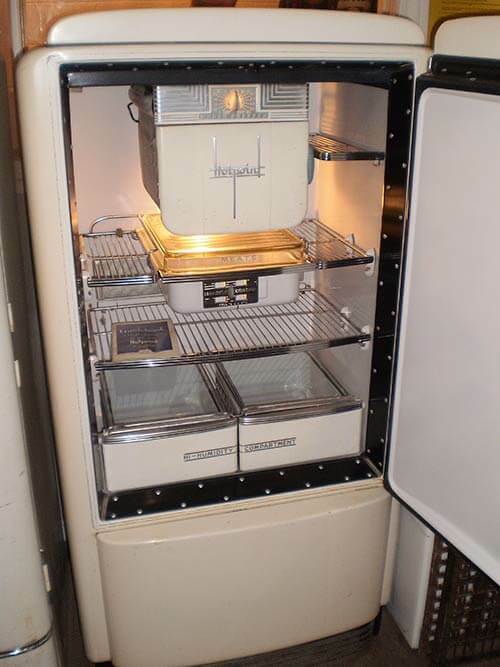 Revco made built-in refrigerator and freezer units that I’m sure were pretty high-end brand. In the photo above, the refrigerator and freezer are shown with St. Charles Steel Kitchen cabinets, the creme de la creme. 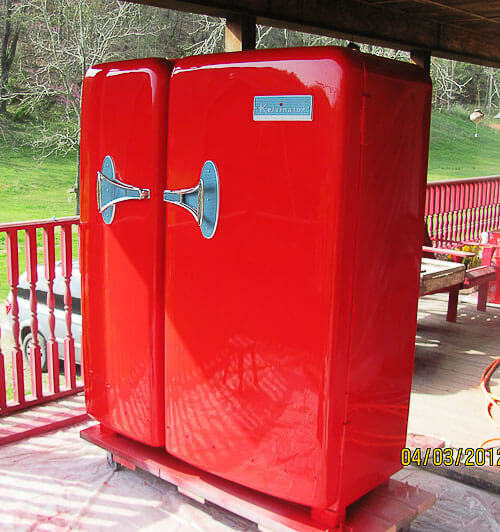 I have a complete catalog of Revco refrigerators from 1956 – so fun to ogle! Are we having fun yet? I am! 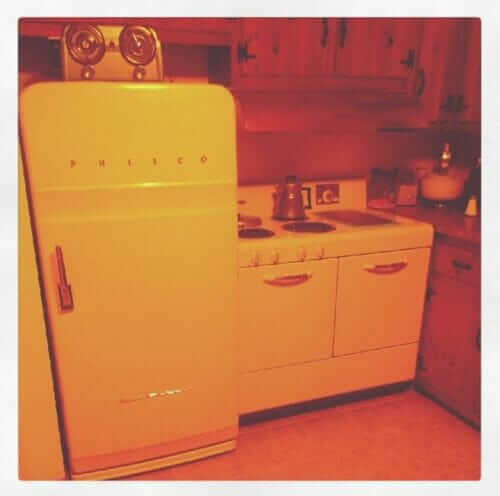 Above: Greg and Tammy’s 1953 Kelvinator Foodarama, which Greg had painted safety red. They purchased it from its original owner, and I’m thinking it was in original working condition. See more great photos of the Kelvinator Foodarama — including its amazing interior features here. Indeed, these old refrigerators are work horses. Above, that’s Amy’s 1941 Westinghouse refrigerator, which has been in constant operation in the same family since it was purchased. At the time the story was published, that was 76 years and going strong! By 1964, GE was giving us a somewhat less ambitious version of their earlier Refrigeration Center. 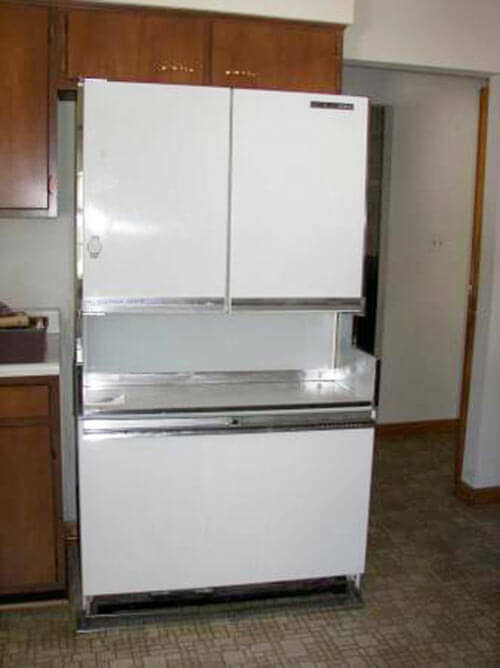 This one is called the GE Americana Refrigerator Freezer, and we have lots of photos and the paperwork, too. This beauty has an ingenious built-in counter area that lights up, and there’s an easy-access electric plug, too — handy! 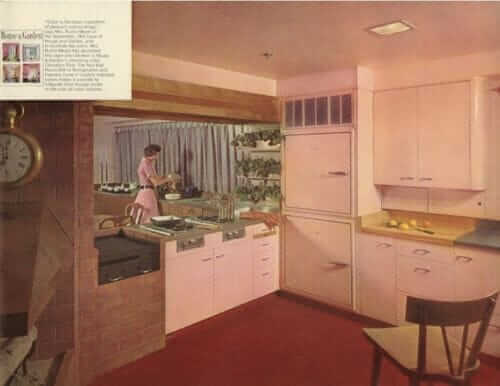 Fast forward a decade… and we get to see how the Kelvinator Foodarama changed by the mid-1960s. Snazzy! The craigslist ad said this side-by-side was from 1955, but then reader Terry bought it and updated that it was from 1966. He said it was in perfect working order. Oh my! Fun fact: The Kelvinator Foodarama gets a shout-out in the big profile of the blog in the New York Times in 2011. I also heard Mrs. Maisel mention it in Season 1! Same diner scene where you can spot Wilsonart Betty laminate on the tables! 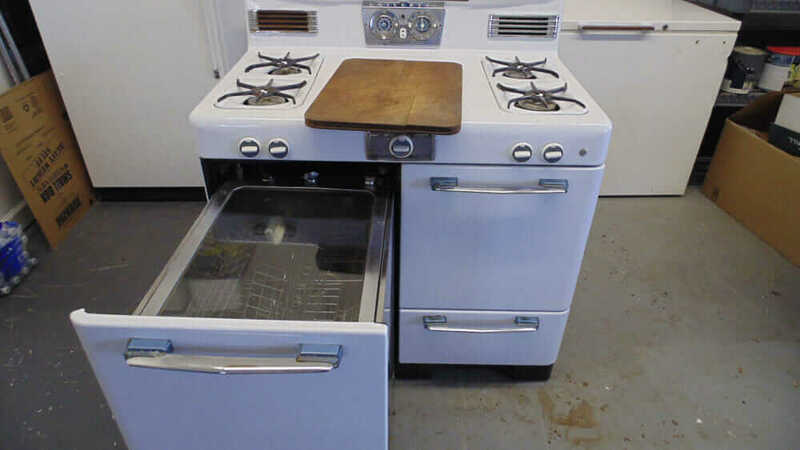 The 1967 limited edition Sears Coldspot designed by Sundberg Ferar seems pretty rare. It even came with an inscribed nameplate for the buyer. Flora was one lucky lady! 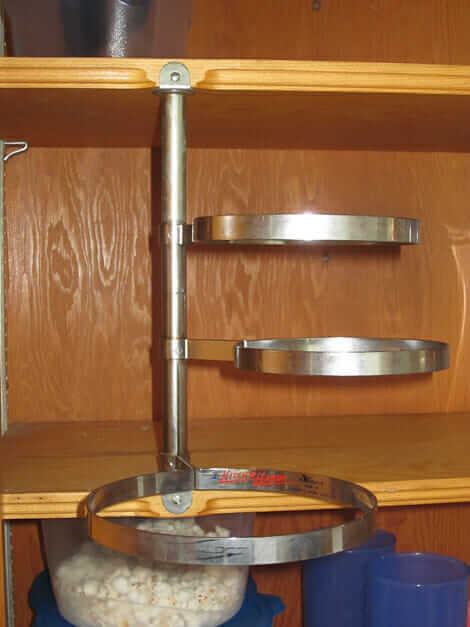 This photo of the Sundberg Ferar design came from reader 52PostnBeam via a 2012 uploader. Ya gotta love the ’70s. Avocado green and harvest gold appliances were rocking American kitchens big-time. On the other hand, this poppy red color on refrigerators, stoves and dishwashers was pretty rare — chosen by truly adventurous decorators. I think. Now, dialing back in time, here’s what the inside of refrigerators looked in the 1930s. Simple. Functional. Beautiful. Solid. This one is Alli’s, also from our uploader. Finally, I couldn’t resist: Chutti’s gone old school — or at least, for collecting purposes — with her 1934 White Seal Ice Box. We have a 1957 GE wall refrigerator in our original St. Charles vintage kitchen. We use it on a daily basis!